Cambridge Judge Business School : The Cadbury Archive : Paper entitled 'Successor to the Cadbury Committee' FRC(94)49 and covering letter 15 November 1994. 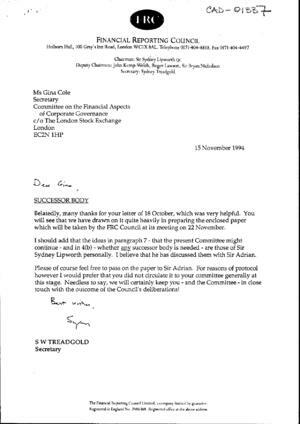 Paper entitled 'Successor to the Cadbury Committee' FRC(94)49 and covering letter 15 November 1994. The paper sets out possible terms of reference and the issues the successor body could address.